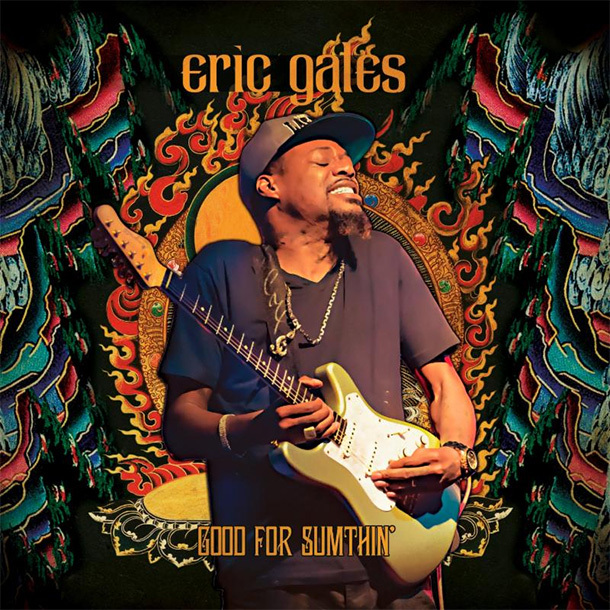 This is Eric Gales’ thirteenth album under his own name since his debut with the Eric Gales Band in 1991. Eric got started early in his life playing guitar at the tender age of four when he began “borrowing” his brother Eugene’s guitar. Although Eric isn’t naturally left-handed, he plays that way because his brother did. However, unlike a lot of other “lefties,” he strings the guitar for right-handed playing. This is one of the things that gives Eric a unique voice on the guitar. Since his 1991 debut at the age of 16, Eric has received accolades from all the great guitar masters of our day including Eric Clapton, Carlos Santana and Eric Johnson, to name a few. He has also guested on many records, as well as been a part of some well received compilation albums over the years. Most recently, he’s been a member of the supergroup Pinnick, Gales and Pridgen who just released their second album this year, simply entitled PGP2, and also announced a 2015 tour. Despite being a full-time member of PGP and touring with Lauryn Hill, Eric found time to make another solo album. Good For Sumthin’ is a no frills, in your face, guitar-driven, blues-rock affair. Producer Raphael Saadiq, who has worked with John Legend, takes a minimalistic approach. The sound is better than demo quality, but still very raw with an underproduced feel. Lamar Carter’s drums and Joel Thomas Whitley’s bass are very dry, meaning there is little or no room ambiance in the sound. Eric’s guitar tone is dripping with fuzzy goodness but there is little if any reverb or echo. The entire album has a very intimate sound,as if the guys are playing right in the room with you. Raphael simply turns Eric loose to do what he does best and keeps everything else out of his way. The album opens with “Come A Long Way.” As the title suggests, Eric sings about his journey from his roots through his success today. The track has an obvious hip hop influence but don’t worry, Eric never breaks into full-blown rap. Although, he does give us a taste of rap in the refrain where he chants “I have come a long way…” The toned down production with the juxtaposed blistering lead guitar work makes sure that no one will confuse Eric with any hip hop artist. The groove is hip hop but everything else about the track screams blues-based rock. Lyrically, Eric sticks to familiar blues themes for most of the record including love lost, going home, the South, standing tall, faith in God, etc. “1019” is a hard driving rock/hip hop number about Eric’s place of birth. “Goin Back To Memphis” is exactly what the title suggests and it’s the only up tempo blues shuffle on the entire record with a nod to Steely Dan’s “Black Friday” with the chord progression in the chorus. The title track “Good for Sumthing,’” is a funky blues riff in the vein of R.L. Burnside or Howlin’ Wolf. “Six Deep” is the closest thing you will find to a slow blues on this record. On the R&B flavored “You Give Me Life” and “Tonight,” we get to hear Eric’s romantic side. On the Prince influenced “Tonight,” Eric’s guitar work is tight and compliments the groove more than any other track on the record. Then there is the all acoustic “Show Me How,” which is the most understated track of the entire collection. Although Eric is primarily known as a great guitarist, he certainly shines in the singer/songwriter role, as well. “Heaven’s Gate,” a song about thug life is the most socially conscious track on the entire record. Again he returns to the hip hop groove with blistering guitar formula. Eric and the band pay tribute to the Stones with their version of “Miss You.” The groove is less disco than the original and of course there’s Eric’s tasteful guitar work that pays homage to Keith Richards melodic riffing while giving it that special treatment that only Eric can bring. The album ends with two guest appearances. Zakk Wylde joins Eric on “Steep Climb” and Eric Johnson trades solos with Gales on the instrumental “E2.” Eric holds his own with both of these legendary guitarists. After being in the music business for almost 25 years, Eric has earned the respect of the world’s greatest guitarists and it’s a lot of fun to hear him trading licks with Zakk and Eric. This is a solid effort from Eric Gales. He burns from start to finish with only a short break to pick up an acoustic guitar for one song. I would love to hear him explore his R&B and hip hop interests a little more seriously and not just dip his toes in those waters. It’s always exciting to hear an artist delve into uncharted territory and he gives us a tantalizing taste on Good For Sumthin’. Still, Eric’s playing is as powerful and as soulful as ever. This is a must-have album for any Eric Gales fan. Zakk and Eric on STEEP CLIMB take the cake… so great. I crank this one up to the max in the studio when I play it on my radio show. Yeah!